The concept of a therapy dog is often attributed to Elaine Smith, an American who worked as a registered nurse for a time in England. She noticed how well patients responded to visits by a certain chaplain and his Golden canine companion. After returning to the U.S. in 1976, Ms. Smith started Therapy Dogs International, a program for training dogs to visit institutions. Pet Therapy, Pet-Facilitated Therapy and Animal-Assisted Therapy are some of the different terms that describe programs in which animals are used to help people. The most widely accepted terms for this field are currently Animal-Assisted Therapy (AAT) and Animal-Assisted Activities (AAA). AAT involves working with someone when a specific goal has been identified. If you do this as a volunteer, you will work with a professional who will assist you in selecting goals for different individuals. AAA are those activities designed to strengthen someone's quality of life. They can be performed by volunteers and are generally "meet and greet" activities. These are what was referred to in the past as "pet visitation." Be sure to check out our Nationwide listing of 300+ Therapy Dog Groups in the U.S., Australia, Canada, India, Italy, and the United Kingdom. 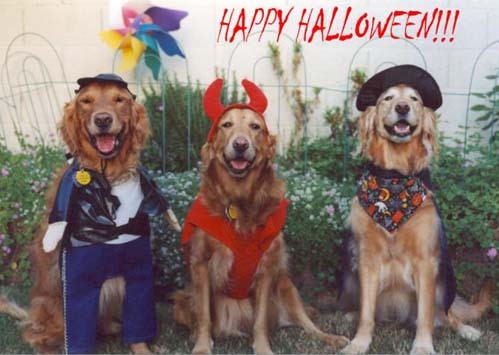 And, do not miss our special stories of those Therapy Goldens who helped at the World Trade Center after 9/11. R.E.A.D. 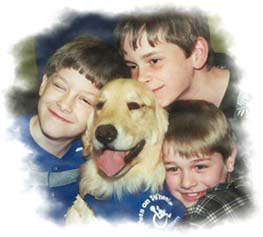 dogs are registered therapy dogs who are working to improve literacy skills. Along with their handlers they have been providing much assistance to those youngsters demonstrating reading lags and associated problems related to poor self-efficacy. Golden Rory, shown here in this wonderful video, is the fourth "R" in the learning equation at Beaver Area Memorial Library. See how this therapy dog helps children practice their reading skills. Intermountain Therapy Animals, a nonprofit organization, launched R.E.A.D. in 1999 as the first comprehensive literacy program built around the idea of reading to dogs, and the program has been spreading ever since! Currently, there are hundreds of registered R.E.A.D. teams working throughout the United States and Canada. The Delta Society has a wonderful introduction to Animal-Assisted Activities and Therapy, covering terms in use, definition and differences between AAA and AAT, the benefits of both, and when they would not be beneficial. Their Animal Assisted Therapy FAQs are also fabulous. The video here comes from the Delta Society and does a wonderful job of expounding on the benefits our four-footed therapy partners provide. We believe that there is a reason that Goldens, in particular, are used more often in helping fields such as these. Be sure to find out . . . The 5 Golden Rings of Animal-Assisted Therapy. Visiting with animals can result in lots of welcome benefits. People may feel less lonely and then less sad or depressed. The change in the routine can help break up the boredom that occurs in nursing homes. It can provide an event that is looked forward to, which can greatly improve persons' moods. Visits can distract patients from doing too much negative thinking about his or her pain or situation. It helps to make folks feel important, as they know someone is coming solely for their benefit. Persons in facilities often don't have the ability to have pets of their own. And, probably, they no longer ha ve the strength to take on the responsibilities of having a pet. But, with these visits, they get a chance to get the pet positives without any of the accompanying work. They can play with and talk to the dogs. This often stimulates past loving feelings and memories of their previous pets. Patients then will open up more and become involved in dwelling on the many happy times they experienced. This is much healthier than thinking about the sad feelings and the current situation. There is much to be said for 'petting power.' Stroking an animal has actually been proven to lower a person's blood pressure. And, it is a form of exercise, as a person is using his or her hands, arms, and upper body. Grooming an animal also provides much stimulation for both patient and pet, as well as that of love and care. Just look at this video short that shows the results of a formal heart patient study to prove how beneficial this petting power can be! What kind of dog makes a good Therapy Dog? Visiting dogs must be social. If the dog does not truly enjoy this kind of visit, the interaction will be not be of much benefit. The person also needs to feel accepted by the dog. A good therapy dog needs to be calm, tolerant and friendly. The visits should be pleasurable for the both of you. You should never try to force therapy work on a dog. There needs to be a balance between that of calmness and friendliness. An obedient dog is wonderful, but he or she also needs to be interested in meeting people. But, if a dog is too calm, they may seem aloof. This would then just cause folks to feel rejected. Extremely friendly dogs may be too high-spirited and then cause injury by jumping up on persons. Temperament is truly the single most important factor. A dog who is friendly and well behaved (no jumping, running around, licking people without permission) can be certified. The dog needs to be trained to work around people who are bedridden or in wheelchairs, and understand what this means with respect to their approaches. This dog should be able to take accidental mishaps in stride (such as when a disturbed patient yells), and deal with the repetitive nature of Alzheimer's patients, for example. Yet, therapy dogs must convey they enjoy their work. Goldens are great prospects because they usually are very accepting and "people-proof." Highly tolerant of physical discomfort and pain, they instead become more upset if they have displeased their human. Therapy dogs can also be those dogs who are suffering with their own disability. It is especially inspiring for a dog with a disability to be imparting love to others dealing with similar infirmities. Check out Therapy Dog Hans who works with rehab patients. Be sure to go and meet Golden Buddy—and view his entire book—online. His own brain tumor inspired a book that gives children the inspiration to fight brain tumors, But not only that, he also shows children how important it is to have support and love. Buddy's message to children is to have hope even when things are difficult. "On one visit Buddy sat with a girl for three hours because she didn't want him to leave her side during chemotherapy. As an added benefit parents who saw Buddy visit their children were cheered up to see that during the brief period that Buddy was with their children, they completely forgot the ordeal they were going through and just enjoyed that moment." Where do Therapy Dogs work? They can work in hospitals, long-term care facilities, hospices, nursing homes, adult day care sites, mental health centers, schools, libraries, special education settings, senior citizen homes, abuse shelters, and children's residential facilities. Therapy Dogs have also been utilized in crisis situations such as those Therapy Goldens who helped at the World Trade Center after 9/11. More recently they have been utilized at universities where there has been tragic loss of life. What do Therapy Dogs actually do? Therapy Dogs promote a feeling of wellbeing by giving unconditional affection. They improve a person's focus and can interact with people who are having trouble communicating (autistic kids, nonverbal persons, etc.). They can help with a person's memory (in Alzheimer's patients). They can encourage speech for stroke patients. 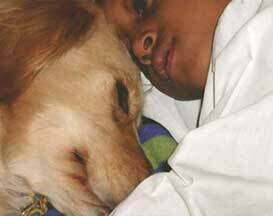 They also are beneficial for recovering soldiers as seen in the video here, with Therapy Golden Charlie. In the book, Afternoons with Puppy, Dr. Aubrey H. Fine details the dynamic relationships and outcomes that can result from utilizing therapy dogs in a private psychotherapeutic setting. His work over almost two decades clearly points to the difference animals can make. Afternoons with Puppy: Inspirations from a Therapist and His Animals is Dr. Aubrey H. Fine’s newest publication (Nov 2007), his seminal book on animal-assisted therapy, Handbook on Animal-Assisted Therapy: Theoretical Foundations and Guidelines for Practice, now in its second edition. Dr. Fine, a licensed psychologist and professor at California State Polytechnic University, is an internationally renowned export on Animal-Assisted Therapy. This video features an Pet Talk Radio interview that he had about the book and his experiences. How are Therapy Dogs certified? There are national organizations and local training clubs for this. Most national organizations require evidence of a stable temperament and/or basic training before they will consider a Therapy Dog prospect. The Canine Good Citizen test is often used for pre-screening. Therapy Dogs International Therapy Dogs, Inc. Does the handler need to be trained? The dog is merely half the team. You must also be able to interact effectively with whoever you are visiting. This means that you will be working at least as hard as your dog. In many places, the professional staff will provide very specific guidance. In nursing homes, though, you will practically be on your own. Try to visit a facility (without your dog) to walk around & get the picture. Then, go again for a short visit with your dog to meet the staff. You must remember, too, that your first responsibility is to protect yo ur dog. Not every patient wants to interact with dogs. It will take time to get a sense of how to encourage some interaction without causing problems. 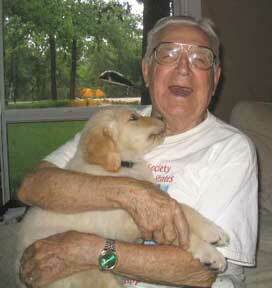 Some patients become very emotional when they recall the dogs of their childhood. They may become upset about the dogs they will never be able to "play with" again now that they are paralyzed. Also, some handlers have trouble dealing with certain types of patients. You need to recognize this and determine what type of person you can be productive with. Holidays are special times for pet visitors to really shine. Here's a message from Marsha Sturm about her special Golden trio: "Here is the latest photo of my three Therapy Dogs - Charlie, Mollie and Cheyenne. Charlie and Cheyenne are rescues. My three volunteer with Gabriel's Angels here in Phoenix are providing pet therapy to abused and at-risk kids in shelters and Boys & Girls Clubs throughout the valley. We also volunteer at Good Samaritan Medical Center. Both visits are different but very rewarding."